Cardio and weight training are important parts of any training program. Performing both in the same session is an effective way to build strength and endurance, but there can be drawbacks to this method too. Your overall exercise goals should determine whether you do weight training or running first. 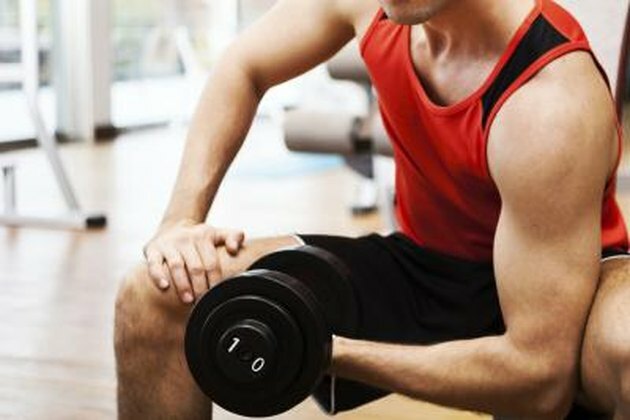 Lifting weights first is the best option to burn fat and build muscle according to coach John Leyva of Built Lean. You'll have more energy for weight training if you do it first, which leads to greater gains in strength and size. It also leads to favorable hormonal changes, such as increased testosterone production. That will boost fat loss and decrease the release of the stress hormone cortisol. It will also lead to a bigger calorie-burn after the session. Running first is your best option if you're training for a run or just want to increase your stamina. Fitness and muscular endurance specific to running are more important than strength for runners. Putting more energy and focus into your running workout before lifting weights is the way to go, according to the American Council on Exercise. An aerobic workout such as running is a good warm-up for a weightlifting session. A moderate-intensity run of five to 10 minutes will increase mobility, warm up your muscles and can help prevent injury. Keep your cardio warm-ups light -- you should still be slightly out of breath but still able to maintain a conversation. Combining aerobic and anaerobic training may not be as effective as performing each on different days according to sports scientist Bryan Haycock. The two work different stimuli, which can cancel each other out. This means you'll improve in both disciplines, but not as much as if you broke them up. From a psychological standpoint, you may also find doing them together far more mentally draining than splitting them up and lack motivation for the second activity. Muscle and Fitness Hers: Ask Our Expert: Should I Lift Weights Before or After Cardio?